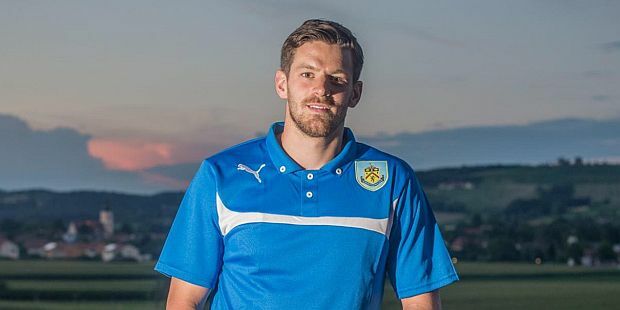 Burnley and Birmingham City have confirmed today that Lukas Jutkiewicz will sign for Birmingham on 3rd January 2017 in a £1 million deal. Juke will be signing a three and a half year contract with the Blues with an option for a further year. It brings to an end what must have been a frustrating time at Burnley having signed for us following our 2014 promotion to the Premier League. At the time he was with Middlesbrough but had been on loan with Bolton during the second half of the 2013/14 season, scoring seven goals for them. Bolton boss Dougie Freedman was keen to take him back to Bolton but missed out to Burnley with Juke signing a three year deal alongside other strikers such as Ashley Barnes and Danny Ings who had ended the previous season in the team with Sam Vokes out long term. He signed while the team were out in Austria for pre-season and made his debut out there, scoring twice in an 8-0 win. In fact the goals flowed during the pre-season with him netting six in all, but once the season got underway he wasn’t able to find the net. I think most of us point to the header in the first away game at Swansea. Who knows? Had that gone in, it might have been a different story. He started the season really well, goals apart, but lost his place as we struggled to find the goals to get wins. Having started the first nine games, he made only one more start and that was in the home defeat against Leicester. More pre-season goals gave us hope in 2015 and he started the season in the first team at Leeds where referee Kevin Friend denied him two clear penalties, one for a foul and the other handball. He started three of the first five games, coming on as a substitute in the other two, and was finally on the winning side when we beat Brentford at home 1-0. This time it was a cruciate ligament injury that took his place, sustained at Bristol City in late August and ruling him out for the rest of the season. Fit again, he was on the bench at the start of this season. He came on in the first two games against Swansea and Liverpool and then made his last appearance for us in the League Cup at Accrington when he came in for some unnecessary negativity from our fans. He was soon on his way to Birmingham and he’s already scored six Championship goals for them and they were always keen to sign him when Gary Rowett was in charge. When Rowett was sacked last week it left the deal in doubt, but new boss Gianfranco Zola wanted him and the deal has been done. He will play his last game on loan for them on New Year’s Day before the deal is completed on 3rd January.